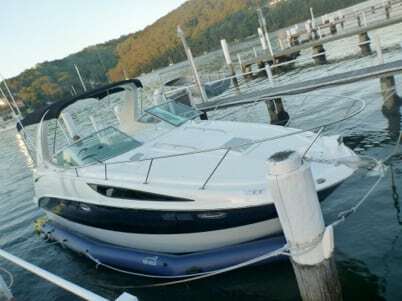 Congratulations to Steve and Bon and the girls on their newest addition to the family; a brand spanking new 28 foot Bayliner. And it is an absolute beauty. And that is before Steve (or was it Bon) added all the extras. I would list them all here but I don’t have enough space. And once Steve had returned with his baby (or is it really Bon’s baby?) we spent some precarious moments hanging out of his tinny and off his jetty (that makes the Brighton Jetty look like a polished piano) to set the FAB Dock in just the right position between his mooring poles. It will require some further tweaking but it will ultimately make berthing so much simpler. Not that I am questioning Steve’s captainancy skills. Thanks for a great day Steve and Bon.